A chorus effect is achieved by mixing a dry signal with a modulated signal (vibrato, delay, etc.) simulating the effect of more than one instrument playing the same part. Traditionally one would mix a vibrato effect and a dry signal in equal portions to get the chorus effect. This may lead to a metallic quality of sound. With the EBC “Blend” knob you can adjust the mix of these two and get tones from mild to wild. 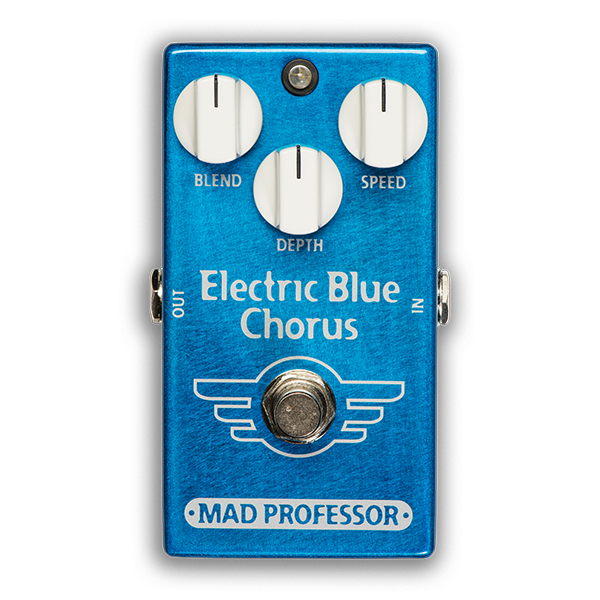 The Electric Blue Chorus (EBC) uses a sine wave generator for a more pleasing and gentle “liquid wave” sound. It also has a very musical modulation with even stronger chorus settings and tones that lean toward vibrato that sets it apart from most other chorus pedals. With the “Depth” and “Blend” knobs one can also adjust in a very mild, barely audible chorus that adds some dimension and depth to your tone.The EBC is also very quiet and transparent with very little filtering. Traditionally chorus pedals have had a treble loss, noise, or a metallic tone, especially when used with distortion. The EBC was designed to be used with both clean and distorted tones and works equally well both in front of or after a distortion pedal. CONTROLS BLEND: This is a control for setting the mix of the modulated and the dry sound. Turn it up for a more intense effect. DEPTH: This a control for setting modulation depth. Turn it up for a deeper effect. SPEED: This is a control for setting the speed of the internal oscillator. SAMPLE SETTINGS (clock positions): Strong chorus: Blend 5, Depth 3, Speed 12 Floating vibe-tone: Blend 5, Depth 4, Speed 10 Fast rotating speaker: Blend 3, Depth 3, Speed 5 Mild chorus: Blend 12, Depth 12, Speed 12 ELECTRICAL SPECIFICATIONS Input impedance: approx. 400K Output impedance: approx. 2K Current consumption: 40mA at 9VDC DC supply voltage range: 9-12 VDC POWER REQUIRENMENTS 6F22 9V battery or DC eliminator 2.1 mm plug center negative and positive sleeve.